(CNSNews.com) - President Donald Trump’s request that Congress include $1.4 billion to fund the beginning of his proposed wall on the U.S.-Mexico border equals approximately 0.035 percent of what the federal government will spend in total this year, according to the latest estimate of fiscal year 2017 federal spending made by the Congressional Budget Office. It also equals less than the Department of Health and Human Services spends in just twelve hours and less than the Treasury collects in taxes in four hours. That is assuming that HHS spends money 24 hours a day and the Treasury collects it 24 hours a day. In its baseline budget projections published in January, the CBO estimated that in fiscal 2017, which runs through September, the federal government will collect $3,404,000,000,000 in taxes and spend $3,963,000,000,000. On March 16, President Trump sent a letter to House Speaker Paul Ryan requesting certain items be included in the continuing resolution that Congress must pass to fund the government for the remainder of the fiscal year after the current CR expires on April 28. This letter requested approximately $1.4 billion for Trump’s border wall project. 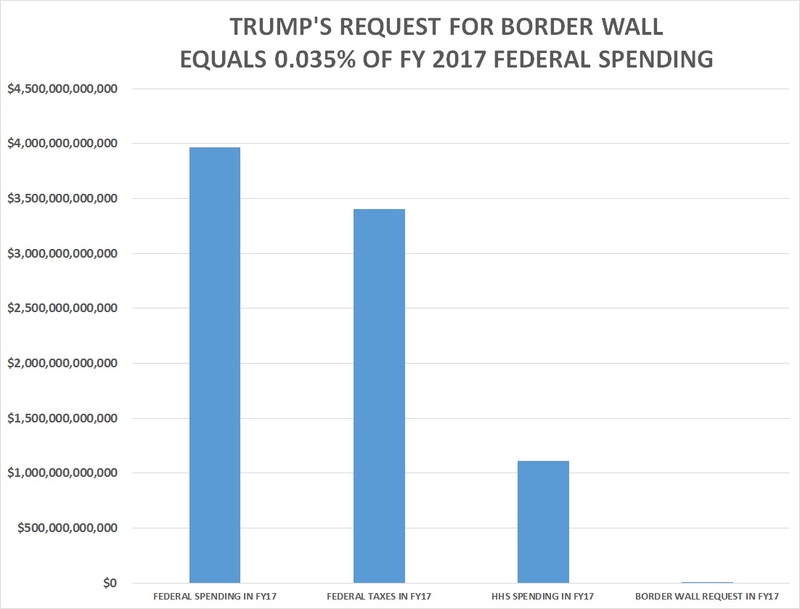 The $1.4 billion Trump wants from Congress in this fiscal year to begin the border wall project equals 0.035 percent of the $3.963 trillion the CBO estimates the federal government will spend this fiscal year. By comparison, the Department of Health and Human Services alone will spend an estimated $1,108,457,000,000 in fiscal 2017, according to the Monthly Treasury Statement. That $1,108,457,000,000 in annual HHS spending equals approximately $126,546,187 for each of the 8,760 hours in the fiscal year. In other words, HHS will spend approximately $126,536,187 per hour this year—assuming that it spends money 24 hours a day. That means that HHS spends in about 11 hours an amount equal to the $1.4 billion that President Trump wants this fiscal year for the border wall project. In half a day—12 hours—HHS spends more than Trump wants for the border wall for the entire year. The $3,404,000,000,000 that the Treasury will collect in taxes this fiscal year, according to the CBO estimate, equals about $388,584,475 in tax collections per hour. The $1.4 billion that Trump wants for the border wall project this year equals about 3.6 hours in federal tax collections. In just 4 hours, the federal government collects more in taxes than President Trump wants to spend for the entire year on the border wall.